Back in April (appropriately) of this year, April Pameticky initiated a joint art/written word project: The Wichita Broadside Project. A series of monthly mixers were held to bring poets and artists together to see if anything clicked, then a call was made for submissions of 11 by 17 “broadsides.” A broadside here is a digital representation of graphics and text bringing together art and words into a whole more complete and meaningful than either might be on its own. Submittals would be evaluated by folks from Harvester Arts and River City Poetry; winners would be chosen by the jury would be printed and the prints provided to the artist/poet collaborators to distribute for posting around Wichita. The aim: to promote poetry and art for public consumption. 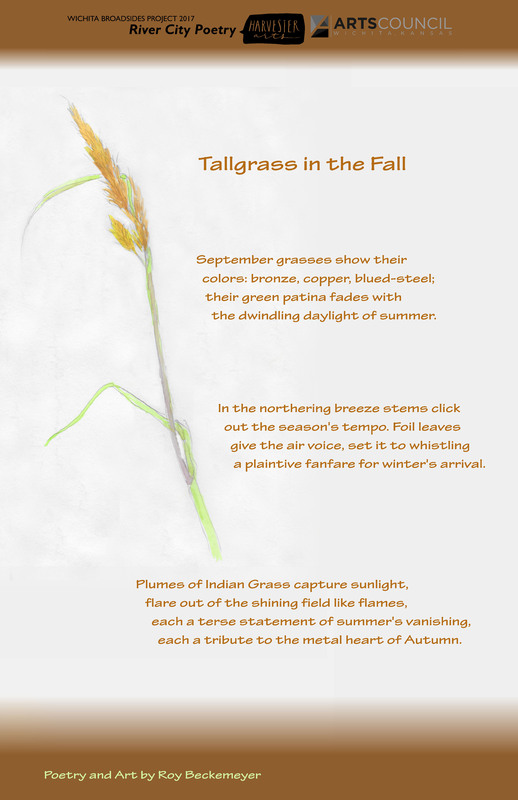 The piece I am showing here today was one I put together myself with a drawing I had done on a walk through Wichita’s Pawnee Prairie Park of some Indian Grass; I added to it my poem “Tallgrass in the Fall.” Not one chosen for distribution but it will be on display on the 27th, and I hope it inspires you to attend the event. Much great poetry and art singing together in harmony. ~Roy Beckemeyer, 3 October, 2017, 07:06, Revised 13:56.